Invest in training that teaches people to continuously improve their processes for better customer satisfaction, increased productivity and lower operational costs providing a great return on investment and value for money. Learning: Learning is the process of picking up new skills. An animal may learn from its own experiences or be taught by another animal, often a parent. Most animal learning is done by observation, followed by trial and error. Play is an important way of learning for many species particularly for honing physical skills such as hunting. Human beings have language, so can speed the whole process up by explaining what the learner is doing wrong and how to correct it. Professional Development: to maintain, upgrade and update skills throughout working life. Our Lean training is based on many years of practical experience and insights gained from improving and transforming organisations from the Financial Service, Public, Manufacturing, Energy, Utilities and Higher Education sectors. The Lean Awareness and Team Based Process Improvement training courses have been accredited by the only industry recognised UK authority qualified to certify Lean training for its content and quality. 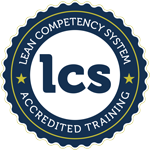 LCS (Lean Competency Systems), licensed by Cardiff University Business School, which only accredits training that develops the thinking, knowledge and practical skills to enable organisations to implement Lean and Operational Excellence. 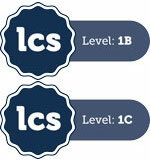 Taken together, with a project submission and online test enables Lean Practitioner certification to levels 1a, 1b and 1c of the LCS framework. Our blended training and experiential learning approach includes highly participative group activities to allow knowledge and idea sharing; using business simulations, games and practical hands-on experience to give delegates the opportunity to apply their learning. Backed up with clear explanations of the principles and theory in their reference workbooks they will be able to applies these techniques immediately once back at the workplace. The wide experience of the trainers supports this learning by providing ‘real’ examples from production and service operations that will be relevant to your people and sector. Delegates are actively encouraged to share their own experiences and best practices as well as to challenge their current ways of working and accepted industry practices. Ongoing coaching develops the skills and practical experience to apply the knowledge appropriately for effective solutions back in the workplace. The certification process ensures participants can demonstrate both theoretical knowledge and applied practise our team can support this journey to an industry recognised qualification. This course will help you understand the history of Lean, learn how to apply the principles of Lean Production in different environments and see how to continuously improve your internal processes by eliminating waste. We will then explain the principles of Lean Consumption to understand your external processes and the effort your customers have to exert to use your services allowing you to provide greater customer satisfaction. This basic course is ideal for those seeking a more efficient and engaging way of working, enables you to support service improvement, cost efficiency and change programmes and prepares you for the more advanced Team Based Process Improvement practitioner course. You will also understand how to apply Operational Excellence techniques to improve your Ways of Working; use 5S workplace organisation, visual management, team huddle boards, use of effective performance measures, interval control boards to manage intra-day demand, skills matrices to develop effective training plans, work standardisation to capture ‘best practice via the ‘one best way’, operational coaching and how to create a culture of continuous improvement through Lean thinking. A more advanced course designed for those looking to lead and successfully deliver challenging process and service improvement initiatives in complex business situations. Enables you to deliver tangible cost savings to operational expenditure within 6 months. This course covers the concept of customer demand split into ‘value demand’ and ‘failure demand’, you will understand the ‘Voice of the Customer’ and the principles of Lean Consumption to reduce the effort a customer has to exert to use your services and improve service levels and customer satisfaction. In addition, it covers improved complaints handling, ‘true’ root cause analysis and importantly how to link these back to improvement activities that prevent them happening again. Ideal for customer service providers, contact centres and the public sector. Tools and techniques essential for effective customer and service improvement programmes. The course covers the drivers for change, how to change organisational culture, Kotter’s 8-step process, the impact of change on people, the emotional and rational responses they have to change, the factors that lie behind resistance to change and how to gain staff engagement, support and buy-in so that any transition can be successfully embedded so that it becomes the new ‘way we do things around here’. This course discusses key theories of how individuals go through change using various models to explore the process. It aims to equip the leader of a change initiative with the understanding and tools to be better able to manage the process, the impact on individual relationships and their reactions to change. It also aims to give strategies to use when helping people through change to ensure effective outcomes and results are achieved. Advanced change management tools, techniques and behavioural understandings essential for effective transformation and people change programmes. Anyone in a leadership or operational role focused on delivering service or products to a customer (including internal customers) where you have an interest in Lean thinking and a desire to simplify your role and improve your efficiency. Senior leaders who wish to gain an overview of lean and understand how it can benefit their organisational performance. Graduates on Management Development Programmes. All of our Lean training can be run as in-house courses, as well as public courses which can be booked via our online submission form. We hold our public training courses in high quality central city venues, however we are happy to source alternative venues if required, for example rural retreats suitable for away days. We ensure all our delegates learn in a friendly, relaxed and open environment with refreshments and lunch provided during the day. These are fun, energetic and interactive courses ideal for teams of people to do at the same time making it more memorable and easier to create a critical mass of agents for change in your organisation. If you have a larger number of staff to train (7 or more) it is more effective to organise a dedicated on-site course to enable better learning and to create a core group who all understand the material and how to apply it. This approach also saves travel, facility hire and subsistence costs if you can provide a suitable training room for the number of delegates you wish to train (15 maximum) and catering in-house. We offer the same level of interactive and engaging training as we provide on our public courses, but there are further benefits; Many people find in-house training less intimidating so it is easier to take on board the content, an on-site course allows you to focus colleagues on a particular issue or challenge that your organisation is trying to tackle and make it a theme for the training. This not only helps focus thinking, but often provides an instant return on training investment. Our trainers come to your location with all their own training equipment and materials. However, you will need to provide a projector with a screen, two flipchart frames, pens and some spare flipchart pads. The room and refreshments are provided by you and the room set-up is informal and depends on numbers: Café style round-tables for larger groups (up to 15, the maximum number of delegates), smaller groups can be accommodated in a boardroom style if the table shape is fixed. Of course, all clients have different needs and our training modules can be combined, augmented and adapted to suit the particular customer requirements. Our bespoke courses are built to your exact specification and budget, often with only essential content adaption time costed in. We have added modules specific to Team Leaders on performance management, coaching, time management and capacity planning. And for technical, optimiser and maintenance staff we have modules covering Total Productive Maintenance. We can edit courses to match specific time slots in away days, incorporate sector specific examples, adapt exercises and even change the branding on materials to align perfectly to your organisation or transformation programme. Where additional Lean support and expertise is required, we can combine our training with tailored on-site project support. A perfect example of this is when an organisation assigns a project to a team member trained in Lean in order to gain LCS certification. Our bespoke, practical help not only helps them achieve this recognition, but also ensures all learnings can be quickly put into place to deliver real results and effective change. We believe that it’s better when everyone works together, that’s why we provide a service dedicated to facilitating post-training workshops. Ideal for those working on Lean projects, these highly collaborative workshops provide the perfect opportunity for trained team members to exchange ideas, get advice and form an internal group that supports one another.